I came at John Ford’s Stagecoach from kind of a weird angle. I was never a huge John Wayne fan growing up. He was my grandfather’s cowboy. Clint Eastwood was my guy. But in 1986 there was a TV remake of Stagecoach starring Willie Nelson, Waylon Jennings, Kris Kristofferson, and – most importantly – Johnny Cash. I was a fan of most of those guys, so of course I wanted to see it. But I was also aware that it was a remake and my special brand of nerd-related OCD prevented me from watching them out of order. It’s taken twenty-four years, but I’ve finally seen them both, plus the one from 1966 that I just learned about as I started writing this. I'll focus on the original one today and write about the other two soon. I can see why Stagecoach is a classic. It’s a great, tight story with powerful themes about outersiderhood and acceptance. It’s a tight story because it’s so simple: a stagecoach full of passengers has to make it through Indian country with Geronimo on the warpath in order to reach its destination. What complicates it is that each of the passengers has his or her own reasons for being aboard, which brings out a lot of opportunity for building relationships and shifting allegiances. Buck (played by Andy Devine, who was also the voice of Friar Tuck in Disney’s animated Robin Hood ) is the coach’s driver, a cowardly man who would just as soon not make the trip except that he’s forced into it by US Marshal Curly Wilcox. Curly’s found out that a wanted criminal named Luke Plummer is holed up in Lordsburg, the coach’s ultimate destination. Meanwhile, Dallas (Claire Trevor) is a prostitute who’s being run out of the town of Tonto by a league of women who’ve set themselves up as the community’s moral police. After the break: the stagecoach becomes a clown car, trouble with WWII-era Indians, and John Wayne. Also being run out is Doc Boone, whose perpetual drunkenness makes him worthless as a medical professional. He’s made friends with Mr. Peacock, a liquor salesman on a circuit with a full case of samples. Lucy Mallory has been on the stagecoach for a while. She’s traveling from the East to join her husband, a cavalryman stationed at Dry Fork, one of the stops along the way to Lordsburg. The final passenger – or so we think at first – is Hatfield (John Carradine), a gambler who seems to know Mrs. Mallory and boards the stage when he finds out she’s on it. A couple of other passengers board later. Henry Gatewood is Tonto’s pompous banker who’s trying to get out of town with a bag full of payroll money he’s just embezzled. He catches the stage just before it leaves Tonto. A good ways outside of town, the coach meets its last passenger, the Ringo Kid (John Wayne). Ringo’s on his way to Lordsburg to find Luke Plummer too. Plummer and his brothers killed Ringo’s family and Ringo wants revenge. Curly takes Ringo into custody, partly because Ringo’s just escaped from jail himself, but mostly because Curly likes the Kid and wants to prevent a gunfight between him and the Plummers. When the coach reaches Dry Fork, they learn that the cavalry has been called away suddenly to Apache Wells. Pressing on to Apache Wells, they learn that the military is no longer there either. And when the cantina-owner’s Apache wife goes missing in the night with some of the horses, the passengers realize that they won’t be able to avoid Geronimo forever. Of course, this is the ‘30s and the depiction of Geronimo and his warriors is very one-sided. In fact, I caught the movie as the opening film in TCM’s Race in Hollywood: Native American Images on Film marathon. Before the movie, Robert Osborne and Professor Hanay Geiogamah (Director of the American Indian Studies Center at UCLA) talked about the time period in general and John Ford’s evolving portrayal of Native Americans in particular. Geiogamah made a very interesting point about how besieged Americans felt by the rest of the world as WWII was ramping up and pressure was on for the US to get involved. Geiogamah contends that Hollywood used Indians to project American fears onto a safe target. It’s a fascinating thought and one thing I wanted to do as I watched the remakes was to see how – or if – this one-dimensional portrayal changes. In Ford’s version, Geronimo and his men don’t talk or have personalities. They’re simply a force of nature. The stagecoach might as well be racing a deadly sandstorm and there would’ve been the same amount of dramatic tension. Except of course that we would’ve been robbed of a hell of a chase sequence and shootout. Something else that doesn’t quite work for me is Hatfield’s motivation for wanting to stick so close to Mrs. Mallory. Maybe I missed something, but that was never adequately explained to my liking. We learn that he’s connected to her family’s activities during the Civil War, but the specifics are elusive. There’s something about a silver cup that he’s carrying that’s supposed to be a clue, but I didn’t connect it. I think a large part of my problem was the casting of Carradine as Hatfield. I’m so used to his being sinister in other films that I never once gave him the benefit of thinking that he actually wanted to help Mrs. Mallory. I suspected him of having ulterior motives the entire time and when they were never revealed, I got confused. I suppose that it’s possible he owed her family a debt and was just selflessly paying it off. A final flaw in the movie is the revelation that Mrs. Mallory is pregnant. Again, maybe I just wasn’t paying attention, but she certainly didn’t look pregnant to me. When she faints partway through the film and everyone seems very concerned about her well-being, I figured it was just one of those nineteenth century things where stress and a fall were a lot more dangerous back then than they are today. Imagine my surprise when Doc Boone has to sober up to watch over her and later produces an infant. I seriously had no idea she was pregnant until I heard the baby crying. Was it considered bad taste in the ‘30s to portray a pregnant woman on screen? Was she showing and I just missed it? The lack of a tummy bulge aside, I really like what the birth of the child does for the group. Doc Boon goes through a kind of redemption as he tries to save Mrs. Mallory and her child. The event also highlights Mrs. Mallory’s relationship with Dallas. Mallory is more or less on the side of the women who tossed Dallas out of town, so while Dallas constantly tries to reach out to the only other woman on the journey, Mrs. Mallory wants nothing to do with her. This comes to a head with Mrs. Mallory lying helpless on a bed and Dallas determined to assist Doc Boone in any way she can. Dallas herself is a treasure. She sounds quite tough when we first meet her, but that's soon revealed to be nothing more than anger and hurt feelings over being forced out. As soon as she settles into the stagecoach, she melts and seems to crave validation and acceptance by the others, especially from Mrs. Mallory. Not in a simpering, whiny way though. She's very quiet and heart-breakingly noble about it. It's sort of hard to imagine her lasting long as the sole prostitute in a frontier town, but I can see how she might have created protective feelings in her clients if they weren't total roughnecks. Speaking of which, I loved Dallas’ relationship with the Ringo Kid. With Mrs. Mallory and Hatfield’s shunning her, it falls to Ringo to stand up for her socially, which he unfailingly does. I’m a sucker for these kinds of romances with two outsiders finding acceptance in each other, so even though it’s a hasty courtship, it works for me. I’m not sure I’d want to visit them in five years’ time to see if they’re still together, but I liked them as a potential couple for this story. And I liked the Ringo Kid in general. He’s driven by revenge, but not blinded by it. He wants to kill the Plummers because of love and duty, but he’s not one of these characters that has nothing else to live for. Even before he gets to know Dallas, you know that he wants to survive the gunfight and get back home to his ranch. With Dallas in the mix, the stakes are raised even further. Even without her though, Ringo’s a likable, easygoing guy and you want him to be okay. It’s easy to see why John Wayne became a huge star because of this film. Four out of five hookers-with-a-heart-of-gold. It's been a while since I last saw this movie, but if I remember correctly Hatfield had served in a regiment commanded by Mrs. Mallory's father during the Civil War and his family and hers apparently formed part of the high society of whatever region they were both from (somewhere in Virginia?) and although she did not know him personally, she knew his kin. The character is of a type John Ford used in a few of his Westerns (another is the sergeant, former Confederate officer, played by Pedro Armendariz in "Fort Apache"), a Southern gentleman fallen on hard times, who moved to the West and now makes his living below his former station, and will sometimes even take an assumed name to protect the family honour. (I'm not quite sure if Hatfield was the real name of the character or if he revealed a different one when he told Mrs. Mallory to go to his father when he died). And by the code of a Southern gentleman, he felt duty-bound to offer a real lady his service and protection, even if it might result in his own death (which is foreshadowed by him drawing the ace of spades just before he decides to board the stagecoach). His code also requires him to save his last bullet for Mrs. Mallory during the final chase, and I have a feeling that the irony that Mrs. Mallory's life is accidentally saved by the Apaches (when Hatfield is killed by an Apache bullet before he gets to "save her from a fate worse than death") was deliberate. Now that you bring it up, I suppose it probably was seen as problematic to show a prominent belly bulge, OTOH in real life not all pregnant women have that obvious a bulge and may choose to disguise it by the way they dress. But the pregnancy was referred to obliquely (as befitted the era the film is set in) by the townswomen who accompany Lucy Mallory to the stagecoach and worry if she should be travelling in her condition. (She replies that there's a doctor on board). You don't see much of the Apache, but that makes sense from a storytelling POV as it is not their story (we also don't learn anything much about the Plummers' life story and motivation, for instance). And IMO it really works a lot better, building up the suspense with an offscreen menace, when the Geronimo and his warriors are not even seen before the big chase scene, so there really was no time to show much. Another thing: The Western movie genre had been declared dead for some years before the release of "Stagecoach", but then it was back. It is such a seminal film that a lot of things in it were imitated so often that they becam clichés themselves, but back in 1939 it actually broke with a lot of genre conventions by making a prostitute the heroine and in the way that on the whole the "respectable" characters (the bank director, the officer's wife, the Southern gentleman fallen on hard times) are painted more negatively than the "disreputable" one (the violent outlaw, the woman of easy virtue, the souse). Thomas Mitchell, who played Doc Boone, also played Scarlett O'Hara's father in "Gone With the Wind" that year - didn't he win an Oscar for one of these two parts? Wow, thank you so much for all the extra details, especially about Hatfield. As I wrote my review, I started to suspect that my typecasting of Carradine was responsible for my mistrusting him, but by then I'd already deleted the movie from my TiVo queue and couldn't go back to check. I obviously need to buy it now so I can watch it again, paying closer attention to Hatfield and the comments about Mrs. Mallory's "condition." Thanks again for the awesome and helpful comments! Honestly, the first on-screen pregnant woman I can think of was Lucille Ball in I Love Lucy, in the 1950s. Thanks for that history. That's what I suspected and it's nice to hear it confirmed. Glad to be of service. I suspect that John Carradine was cast deliberately to highlight the inherent duality of Hatfield's character. On one hand he embodies a romantic ideal of chivalry, yet at the same time "Stagecoach" calls this ideal of a bygone age into question because it is preconditioned on privilege and the idea that gentlemen and ladies are better than the likes of Dallas and Ringo (Doc Boone pointing out that he once extracted the bullet from a man shot in the back by a gentleman, this nearly leading to a fight with the accusation hanging in the air that that gentleman may have been Hatfield himself or one of his friends, with Ringo saying placatingly "he didn't name names") and this ideal almost costing Mrs. Mallory her life. But still Hatfield is a character with great redeeming qualities and an ability to learn (vide the change of his attitude towards Doc Boone) and so he is given a good death scene, while the more "modern" member of the upper class, Gatewood the capitalist, has no sympathetic qualities at all. Awesome write up. Wayne was my Grandfather's cowboy too. I actually lived with my Grandfather for a few years, so I spent hours watching them with him. So while I've seen all the Eastwood films and love most of them, I guess Wayne is my cowboy too. I never trusted Hatfield either. He just came off too smarmy. The TCM marathon was good. I'd have rather it ended with She Wore Yellow Ribbon instead of Fort Apache, but that is just because I love Ben Johnson's role it in. Menshevik: I'd forgotten all about that bullet-in-the-back comment, but that certainly added to my overall impression of Hatfield. I was certain that Boone was talking about him. Your pulling out all these nuances makes me want to watch the movie again sooner rather than later. Ken: Welcome! After Stagecoach, I'll be watching some more John Wayne. The Searchers is already a favorite, but I still need to see Fort Apache and some of the other big ones. I'm definitely looking forward to your views on those other movies. Fort Apache is definitely one of my all-time favourites, a quintessential John Ford film. Ha! I love it. Those are the best kinds, after all. 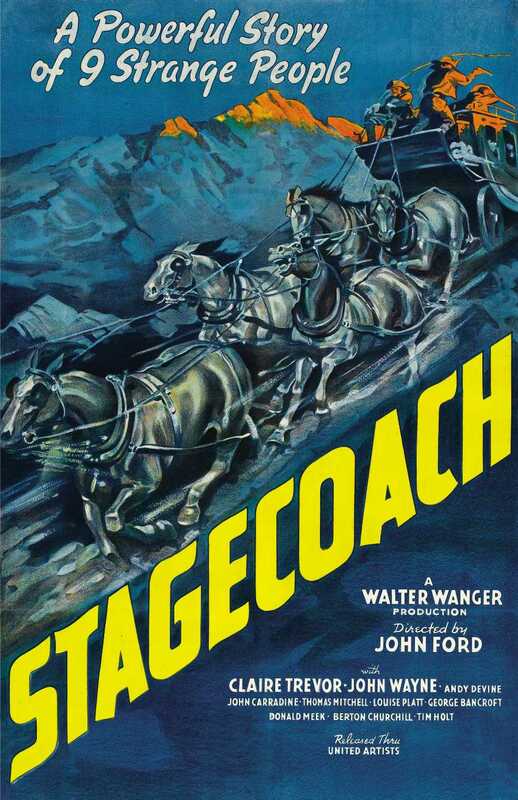 I've had "Stagecoach" on my to-watch list for awhile, but your review has me moving it up that list. Cool! I'm hoping to find time to at least start the '60s remake this afternoon.